Patricia McKellar, Senior Lecturer on the Undergraduate Laws Team, recently visited Southern Africa. While she was there she took the opportunity to meet with students on the ULP. 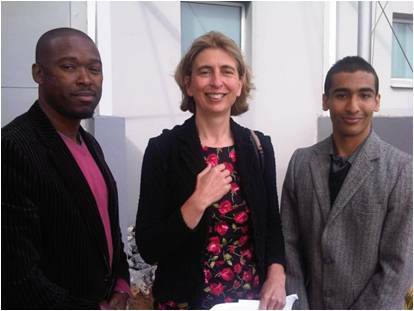 In Johannesburg she met with Patrick Musa (Year One) and Shér-Muhammad Khan (Year Three). Sher is studying the programme to gain a degree with a more Commonwealth perspective and hopes to begin working in commercial law in an international firm. He wants to engage with the emerging economy of South Africa and, through the programme, hopes to obtain the skills to let him achieve this. As there are no provider institutions in Southern Africa the students there are all self study. Shér-Muhammad Khan was home schooled so he understands the motivation necessary to keep going when there is little f2f contact or peer support. However, like other students, he has formed a study group and has recruited members from Trinidad, Singapore, Malaysia and the UK. Although he has never met them, he likens them to a form of ‘online cyberfamily’. The group meet regularly online to discuss aspects of the course with each member being assigned a particular topic to ‘teach’ the others. Shér-Muhammad says it helps him to feel less isolated and gives a sense of belonging. Patrick Musa works in the Planning Department but always had an interest in law. As he was in employment he couldn’t take time away from his job to study for three years. The distance learning UL Law degree was the ideal way to allow him to gain a good qualification while still retaining his employed status. Patrick had researched other programmes and was was attracted to UL degree as it was provided jointly by six internationally renowned institutions. Although he was just at the start of his degree he was looking forward to the opportunity to increase his knowledge of law both to enhance his current career prospects and to give him a more international perspective in the future. When asked what his friends and family thought of him doing the degree he said ‘I’m living a lot of people’s dreams’. I would have been certain that Southern Africa is not exactly South Africa. What happened, was there a visit to other countries? Just wondering. Thanks Peter, the visit included Namibia as well where I also met students studying for the ULP. Just waiting for some final information before I can add their details to the blog post as well. We’re planning to go back there next April so hope to meet up with more students at that time too. Did you u also visit Botswana? No- I didn’t visit Botswana as I only had a short time. I’d love to go there the next time as we have a few law students there. At the moment we have no provider institutions for Laws in Southern Africa so all our students there are self study. If I vsisit Botswana I will contact our students there. My name is Puso Kedidimetse. I registered with the University of London International Programmes this year and i am on the Graduate LLB program.It would realy help Patricia if you come to Botswana and interact with us. We are coming to South Africa next April for conferences in Durban and Cape Town. I’ll make sure we put some information on the blog nearer the time so that anyone in the area can arrange to meet us. If we decide to visit other countries at that time we will let you know this too. I would like to believe you are based in Zambia? If so, can we link up somehow and possibly compare notes as they say if you don’t mind. I am based in Livingstone and believe me studying the LLB all alone can be quite lonesome! Hi BoLubinda. I am based in Lusaka and my email address id c.chilufya@pacra.org.zm my cell is 0977216715. We indeed can benefit from an exchange of notes and cross pollination of ideas reagarding our student experiences. You might have to consider visiting all southern African countries associated with the ULP, so that everyone benefits from the interaction. Anyone studying from Zimbabwe by any chance? Where in Zimbabwe are you? I am live in Livingstone just across the Vic Falls. Bulawayo. About 5 hours from Victoria Falls. If we can get off the public forum, please mail to tm115@london.student.ac.uk Thanks. Are you based in Zambia?